Most scholarship on nineteenth-century America’s transformation into a market society has focused on consumption, romanticized visions of workers, and analysis of firms and factories. Building on but moving past these studies, Capitalism Takes Command presents a history of family farming, general incorporation laws, mortgage payments, inheritance practices, office systems, and risk management—an inventory of the means by which capitalism became America’s new revolutionary tradition. This multidisciplinary collection of essays argues not only that capitalism reached far beyond the purview of the economy, but also that the revolution was not confined to the destruction of an agrarian past. As business ceaselessly revised its own practices, a new demographic of private bankers, insurance brokers, investors in securities, and start-up manufacturers, among many others, assumed center stage, displacing older elites and forms of property. Explaining how capital became an “ism” and how business became a political philosophy, Capitalism Takes Command brings the economy back into American social and cultural history. Michael Zakim is associate professor of history at Tel Aviv University. He is the author of Ready-Made Democracy: A History of Men’s Dress in the American Republic, 1760–1860, also published by the University of Chicago Press. Gary J. Kornblith is professor of history at Oberlin College and the author of Slavery and Sectional Strife in the Early American Republic, 1776–1821. "This exemplary collection of essays provides the most finely tuned and precise renderings we have in the literature of a burgeoning culture of capitalism that created new economic practices, instruments, and institutions and shaped the ways in which Americans perceived and made meaning of the epic social and cultural transformations unfolding around them. 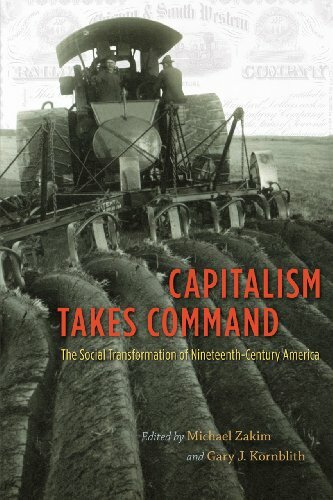 Capitalism Takes Command is required reading for specialists in nineteenth-century American history, economists, and students of American culture."